05.27.17 The MMMF memorial was unveiled to the public during a special ceremony at Jefferson Barracks park. 04.10.17 The groundbreaking for the memorial took place at Jefferson Barracks park in preparation for the memorial to be built. 11.24.16 The MMMF is excited to announce the memorial is being built at the quarry. 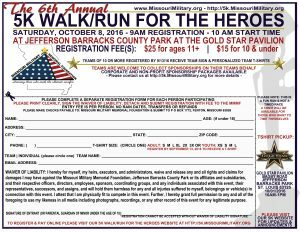 05.31.16 The MMMF announced their 6th Annual 5K Walk/Run for the Heroes that is taking place on Saturday, October 8, 2016 at Jefferson Barracks Park Gold Star Pavilion. 05.11.16 The MMMF announced the Gold Star Pavilion Brick Campaign. Deadline is July 31, 2016. 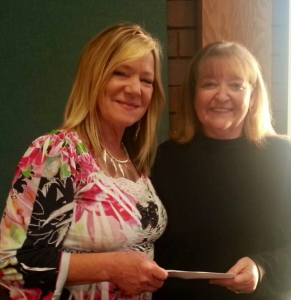 10.22.15 The American Gold Star Mothers, Inc. – St. Louis Chapter donated $2500 to the MMMF. Click here for more details. 10.20.15 We are happy to announce that our 6th Annual Trivia Night will take place on January 16, 2016. Please click here for more details and the registration form. 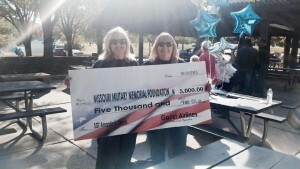 10.10.15 GoJet Airlines donates $5000 to the MMMF. Click here for more details. 10.10.15 You can view the photos from our 5th Annual 5K Walk/Run for the Heroes by clicking here (for MMMF & others photos), here (for Red Cloud Allied Enterprises, LLC photos) & here (for KSHE 95 photos). Team photos can be located here. 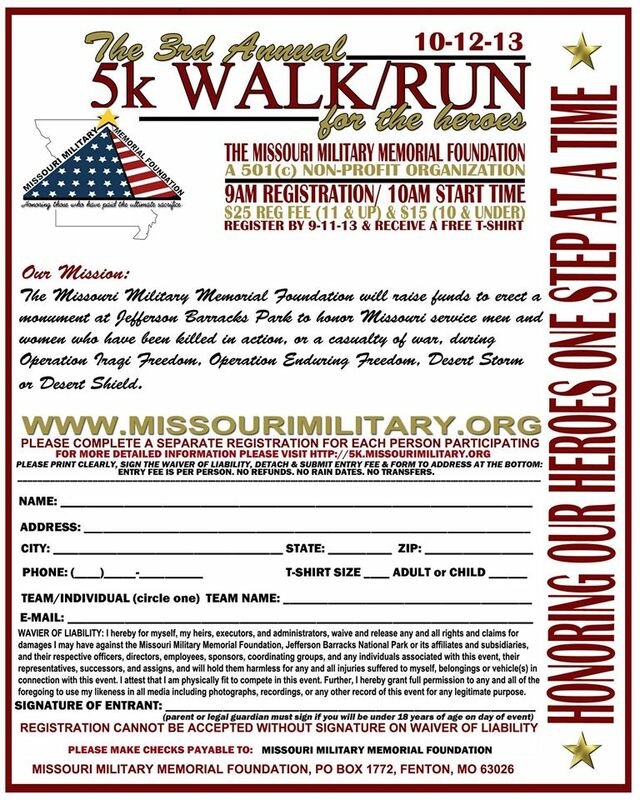 07.05.15 The MMMF will be hosting it’s 5th Annual 5K Walk/Run for the Heroes on October 10, 2015 Please visit our 5K website for more information and/or to register. 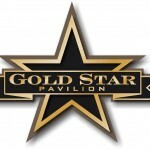 05.09.15 The MMMF will be hosting it’s Gold Star Pavilion Ribbon Cutting on May 9, 2015 at 11 a.m. This event is open for the public to attend. For more details and to R.S.V.P. please visit the Facebook event page. 04.25.15 The MMMF will be hosting it’s Bowling for Heroes on April 25, 2015 at Brunswick Zone Lakeside, located at 1254 Doughtery Ferry in Valley, MO from 6pm-9pm. You can view the photos from this event by clicking here. 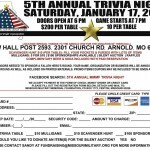 01.17.15 The MMMF is proud to announce that we will be hosting our 5th Annual Trivia Night to be held at the Arnold VFW Post 2593, 2301 Church Road, Arnold, MO 63010. You can view the pictures from this event by clicking here. 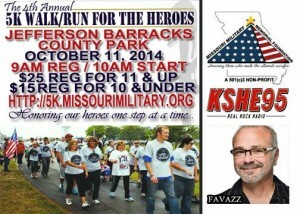 10.12.14 Our 4th Annual 5k Walk/Run for the Heroes was a great success. We appreciate all of our sponsors (American Legion, Carroll County Memorial Hospital & Vinson Mortgage), Favazz, KSHE 95, World Bird Sanctuary, Lemay Fire Department, Speedway Eatery and all of the participants & volunteers for such a successful event! You can view the pictures at this location. Team photos can be viewed here. 09.04.14 Pictures from our Gold Star Pavilion Groundbreaking ceremony can be viewed here. 08.25.14 Groundbreaking ceremony scheduled for Gold Star Pavilion on September 4, 2014. Please click here for the official press release. You can view the groundbreaking ceremony pictures by clicking here. 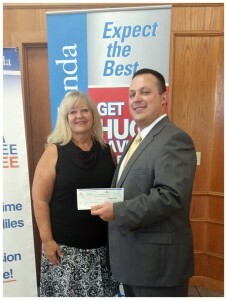 08.19.14 We would like to extend our gratitude to Joe Trujillo and West County Honda for their generous donation to the Missouri Military Memorial Foundation via their Drive it Forward Campaign. 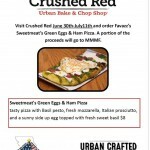 6.30.14 – 7.11.14 Visit Crushed Red between June 30th and July 11th, order KSHE 95’s Favazz’s Sweetmeat Green Eggs & Ham Pizza and you’ll be helping raise money for the Missouri Military Memorial Foundation. 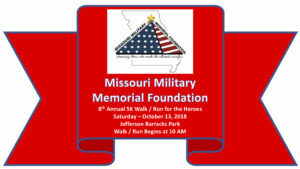 6.03.14 SPECIAL ANNOUNCEMENT: The MMMF will be hosting our 4th Annual 5K Walk/Run for the Heroes on Saturday, October 11, 2014 at Jefferson Barracks County Park. Stay tuned for more information! 5.24.14 PAVE THE WAY FOR HEROES: The MMMF is hosting a Father’s Day special for our Pave the Way for Heroes campaign. If you purchase a brick between May 24 and June 22nd to honor your Father or son they are on sale for $200 (quantities are limited). All brick purchases will be honored during this sale period so please act soon. 04.26.14 Pictures from our 4th Annual Trivia Night can be viewed here. 2.15.14 The MMMF is proud to announce our 4th Annual Trivia Night. Tables up to 10 people for $200. Beer and soda included. Save the date more info and Trivia flyer coming soon! Limited to maximum of 28 tables of 10. Silent Auction, 50/50 and more! All proceeds go towards building the Gold Star Pavilion and Memorial. Special thanks to the Arnold VFW for donating the Hall for this fundraiser, 2nd year in a row! 01.14.14 We’re proud to announce our new program, PAVE THE WAY FOR HEROES, will be beginning tomorrow. The Pave The Way For Heroes program, allows you to purchase an 8 inch x8 inch brick in support of the fundraising efforts to build a memorial that will honor the fallen Missourians who were killed in action or were a casualty of war during Operation Iraqi Freedom, Operation Enduring Freedom or the Desert Storm/Desert Shield Conflicts. 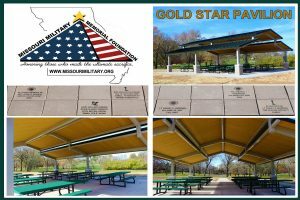 These bricks will be displayed around the GOLD STAR Pavilion, located at Jefferson Barracks Park in St. Louis, which is planned to be built the summer of 2014 (phase 1 of the project), and can be customized with a name or personal message*. *All bricks are subject to Missouri Military Memorial Foundation board member approval. 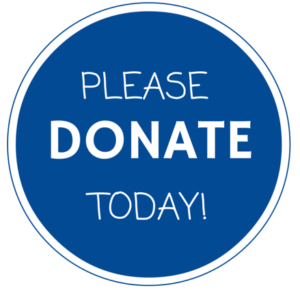 If message is not approved by the board, donation will be refunded. To learn more about it, please visit our Facebook group page. 10.23.13 Our 3rd Annual 5K Walk/Run for the Heroes was a great success. Not even the rain could damper the spirits of over 800 participating. Many thanks to everyone for their support and to our sponsors: Ameren, American Legion Post 162 (Lemay), Heroes Way and A Soldier’s Wish List. We’ll be back next year so stay tuned for more information! You can view the pictures from this event here. The team photos are located here. 08.25.13 Jennifer Jerome of the Missouri Military Memorial Foundation was interviewed for today’s Talk of the Town spot on 106.5 THE ARCH, 92.3 WIL and 101 ESPN in St. Louis courtesy of Hubbarb Radio. You can hear the interview by clicking here. 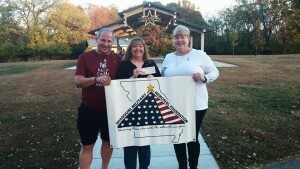 07.18.13 The MMMF is proud to announce that we received a generous donation on behalf of Carol Biggerstaff from The Missouri East Central Elks Lodges (East Central District). 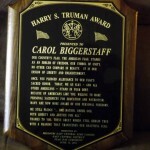 Carol was awarded the Harry S. Truman award and was able to choose her favorite charities to donate to. She chose to donate to A Soldier’s Wish List along with the MMMF. We are sincerely grateful to Carol for such a wonderful contribution as well as her patriotic dedication that she has for our troops, both past and present. 06.09.13 Our 3rd Annual Golfing for Heroes was a great success! Special thanks to our red sponsor Vinson Mortgage; White Sponsors: Dobbs, 97.1FM, Truck Centers Inc., Arrowhead Building Supply Inc./Tamko Building Products, Assisted Recovery Centers of America & Gulf Shores Restaurant; those who supplied food, auction items, the golfers, our volunteers. We are so grateful for everyone who helped make it such a great success; you are each truly appreciated. To view the pictures from this event, please click here. 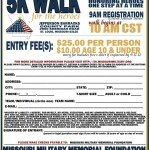 With that said, it is now time to announce our 3rd Annual Walk/Run for the Heroes. 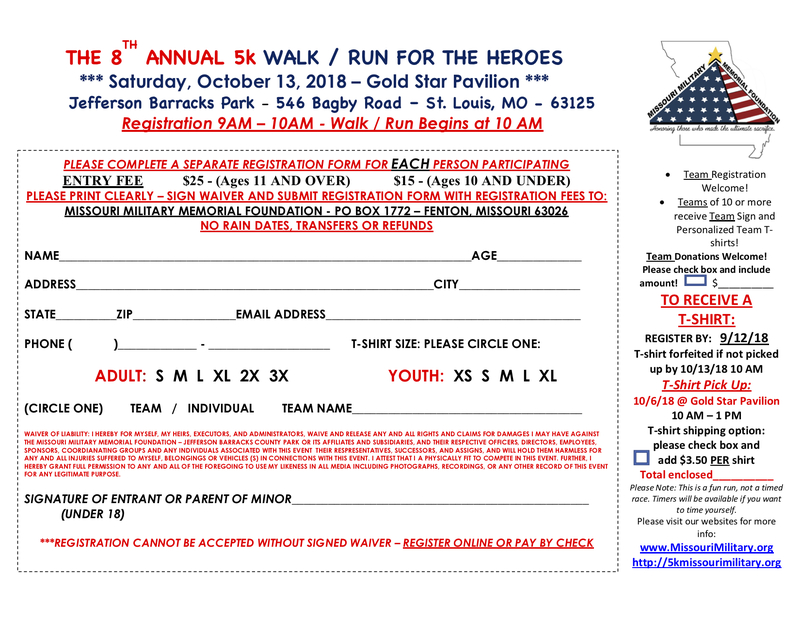 This year’s 5K will take place on October 12, 2013 at Jefferson Barracks Park (same location as last year). 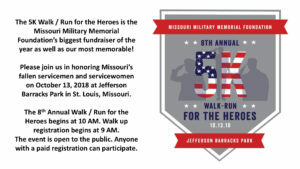 Please visit our official 5K Walk/Run for the Heroes website by clicking here and reading through the “Information” page for further details. 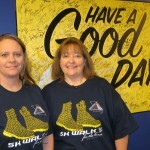 Last year’s 5K Walk/Run for the Heroes was a huge success and we hope to meet even more of you this year. 04.05.13 The MMMF is proud to announce that our 3rd Annual Trivia Night was a great success. As always, we had a lot of fun! We greatly appreciate Clint Woodfin for volunteering to be our emcee for the evening, those who purchased tables, those who donated items for our silent auction, the Arnold VFW Hall and our volunteers. Our next upcoming event will be the 3rd Annual Golfing for Heroes event taking place on Friday, June 7th, 2013 at Quail Creek Golf Course in St. Louis. Please see our EVENTS page for more detailed information. In other news, special thanks to Allianz employees and Becky Cartwright for their donation of $276. They sold valentines and suckers for 50 cents each and donated the profits to our 501(c)3 non-profit organization. 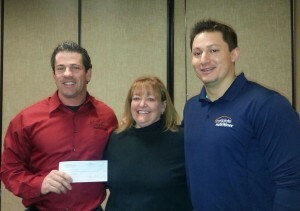 Complete Nutrition also donated $2500 to the MMMF this past January — we are sincerely grateful! Last, but not least we would like to extend our gratitude to Carol Biggerstaff for asking State Rep. John McCaherty to help us gather letters of support for a grant that we are trying to receive. 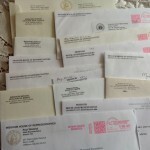 Because of their kindness we have received over 40 letters via various State Rep’s from the State of Missouri. 12.10.12 We have lots of news to report: A $2500 Grant received from Enterprise, $17,031 from the Citi Jean Program and $4,000 from the American Gold Star Mothers – St. Louis Chapter have put the Missouri Military Memorial Foundation over our first $100,000 mark! 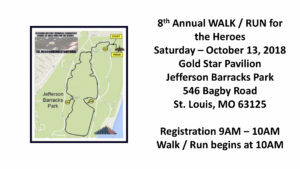 3rd Annual 5K Walk/Run for the Heroes: October 12th. The MMMF would like to announce that we have been given our Letter of Intent from Jefferson County Parks to erect the monument in their park; we are truly excited about this location! Last, but not least Jim Jacobs, father of SGT Zachary Fisher, has joined the MMMF Board of Directors. 10.20.12 Pictures from our 2nd Annual 5K Walk/Run for the Heroes can be viewed here. 09.15.12 Sue Garrett, of the Missouri Military Memorial Foundation, sat down with Andy Banker of Fox 2 News in St. Louis to discuss the upcoming 5K Walk for the Heroes event taking place October 20th, 2012 at 10 a.m. at Jefferson Barracks County Park. 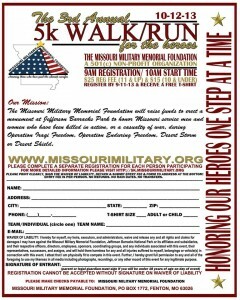 07.30.12 The MMMF is happy to announce our 2nd Annual 5K Walk for the Heroes will be taking place on October 20th at Jefferson Barracks. Please see our Upcoming Events page for more information. In addition to this wonderful news, we are pleased to announce that Amy Brindisi from the Vinson Mortgage Group has joined our Advisory Board. We have worked with Amy, in the past, are extremely grateful that she has chosen to join us in our endeavor of honoring our fallen military personnel from Missouri. 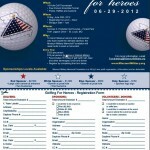 05.06.12 The MMMF proudly announces that we will be having our 2nd Annual Golfing for Heroes at Norman K. Probstein Golf Course in Forest Park on Friday, June 29th, 2012. 02.19.12 Pictures from our 2nd Annual Trivia Night can be viewed here. 01.28.12 Photos from the Welcome Home Troops Parade can be found here. 01.10.12 The MMMF would like to welcome Randy Mardis to the Advisory Board of the MMMF. Randy is the President of Landscape Technologies & has already proven to be an important asset to our mission. The MMMF would also like to thank Telcom Pioneers, Missouri Chapter #11 for their generous donation of $1000.00. In other news, please mark your calendars for March 24th, 2012 as the MMMF has been selected as the non-profit for the 11th Annual St. Pat’s Charity Pub Crawl in Soulard (St. Louis). 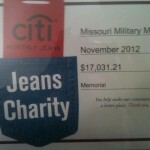 And finally, the MMMF has been selected as the November 2012 recipient for the Citi Jeans Charity via Citi Bank! 12.07.11 The MMMF will be hosting their 2nd Annual Trivia Night at Genesis Banquet Center in St. Louis. 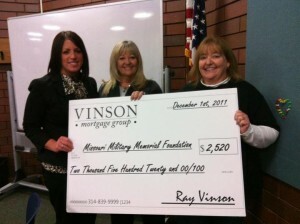 12.06.11 Vinson Mortgage Group donated a $2520 check to the MMMF. We are entirely grateful for their donation. 10.06.11 Pictures from our Golfing for Heroes event can be located here. 09.15.11 The MMMF is proud to announce our newest Advisory Board Member, Eric Greitens. Eric is the CEO & Director of MissionContinues.org. We’re very pleased to have Eric on our Advisory Board and are looking forward to working with him. 09.14.11 The MMMF is proud to announce our newest Advisory Board Member, Lauren Bruning. Lauren is an attorney with Thompson Coburn LLP. We are truly excited that she has volunteered her services & believe she’ll be a wonderful addition to our foundation. In addition to this great news we also wanted to share our letter of support from the Mayor of St. Louis, Francis G. Slay. Please click here to view it. 09.04.11 Pictures from the 5K Walk/Run for the Heroes can be located here. Team photos can be viewed by clicking here. 08.21.11 The MMMF was interviewed this morning on Fox 2 in regard to the upcoming 5K Walk for the Heroes event taking place on September 4, 2011. 08.16.11 The Golfing for Heroes has been announced to the public. It takes place on Thursday, October 6th, 2011 at the Norman K Probstein Golf Course in Forest Park and begins at 12 (noon). The public is welcome to register. 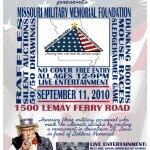 07.13.11 We are pleased to announce that Corey Schuster of the Semper Fi Society (St. Louis) & Frank Haase of R.G. Ross Construction have joined the MMMF as an Advisory Board Members. 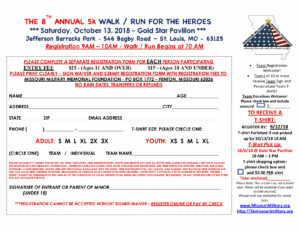 06.16.11 The 5K Walk for the Heroes has been announced to the public & will run in conjunction with the Missouri Veterans Foundation. 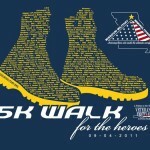 It takes place on Sunday, September 4th, 2011 at Forest Park and begins at 8am. Everyone is welcome. 05.27.11 We are pleased to announce that Joe Frank has joined the MMMF as an Advisory Board Member. Mr. Frank currently serves as an Adviser to the National Commander of the Legion and a member of the Board of Directors of the American Legion Child Welfare Foundation. He is an active member of several civic and Veterans organizations currently serving on the Jefferson Barracks Heritage Foundation, and a co-founder of the St Louis Homeless Burial Program which continues to grow throughout the nation. 04.21.11 We are pleased to announce that Jamie Allman has joined the MMMF as an Advisory Board Member. We also welcome our new partners Fallen Hero’s Dream Ride & The Regional Alliance for the Troops (RAFTT). 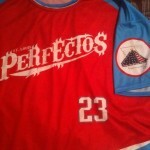 03.02.11 The St. Louis Perfectos Softball Team will be donating 10% of all funds raised directly to the MMMF via their Trivia Night that will be taking place on Saturday, March 19th, 2011. 02.22.11 The MMMF received their 501(c)3 status last month. 12.28.10 The St. Louis Chapter of Gold Star Mothers is now officially endorsing the Missouri Military Memorial Foundation. 11.07.10 Pictures from the Bowling for Heroes event can be viewed by clicking here. 10.30.10 Interview with Fox Morning Show about the upcoming benefit “Bowling for Heroes” and talking about the Foundation itself. 10.15.10 Partnered with Beautiful Day Publishing. 10% of each sale goes to the MMMF. Free shipping offered to each customer. See details here. 09.29.10 Announced “Bowling for Heroes” fundraiser on November 6th, 2010. Announced the “Trivia Night” fundraiser on January 29, 2011. Details coming soon. 09.11.10 Our first fundraising benefit was extremely successful! Thank you to all who contributed to our cause to honor our fallen, the St. Louis Rams Cheerleaders, Isaac James, Some Other Place Bar & Grill, the volunteers… everyone! Click here to see the pictures from today. 09.04.10 Purchased the domain and hosting package today. 08.28.10 Raised approximately $770 at the Dierberg’s (Fenton Crossing location) from 10 a.m. -4 p. m. Thanks to everyone who contributed & volunteered their time. Click here to see the pictures from today.